Andres Lagunas began pursuing a degree in political science at DePaul University this past year as a Pullman Scholar. He has ambitions to help others throughout his life and believes that his scholarship from the George M. Pullman Educational Foundation will help him on his journey. He is seen above volunteering for his DePaul chapter of Habitat for Humanity. We checked in with Andres to chat about his first year of college and to ask what being a Pullman Scholar means to him. What drew you to your college at DePaul? Throughout my life, I have seen social inequality embedded in the community that has nurtured and raised me. It was embedded before I even knew it was there, and it was there before my family knew what it was and how it got there. From childhood, I felt like I was, without choice, supposed to be a product of pain and violence. Growing up, I was ascribed as a “minority” without approval. I was put into a system that I did not know was in place and told that if I was lucky, I could one day make something of myself. But I did not want to rely on luck. I wanted to prove that I am not a minority because being a minority means that I am less than everyone else when I am not. As I progressed through high school I knew that I did not want to settle for less but rather I wanted to settle for more. I wanted my life to be as complex and fulfilling as my Hispanic identity. I wanted to know that life offers more than forced smiles. I wanted a chance at true happiness and liberty. I needed a chance to escape. My college was that escape. DePaul University, to me, represents social justice. It has allowed me to represent its Vincentian mission and given me the opportunity to make something of myself, and that has meant more than what any fortune could denote. What are your passions or hobbies? My passions in life include helping others, uncovering the mysteries of the universe, and giving back to the community. That is essentially what I center my time around. Whether if I am helping out in the Habitat for Humanity Chapter at my school or teaching children the foundational literacy skills they need to succeed in their later years of education, I feel as though I am always trying to give back to my community. I aspire to make a change and unfold the untold chapters of my life, so I use my time as a way to make a positive impact and bring a sense of jubilation to someone else. What is different about college than high school? The first semester of college has been a time for growth. It has allowed me to explore my passions and interests while staying true to myself. It has granted me the opportunity to meet new people and experience things I did not even think about before. It has proved to be a time of reflection and a gateway to many future opportunities and career pathways. College, in general, seems so different from high school because it is greater in size and has many more resources. It develops the need for independence, allows students to be advocates for what they believe in, and ultimately themselves. Personally, what makes college much more different than high school is the availability to learn about nearly anything and learn about topics that are actually worthwhile and of interest. What do you like about being a Pullman Scholar? What does being a Pullman Scholar mean to you? I have grown as a flower does between the cracks of sidewalks. My potential to bloom has always been within me, but I feel as the Pullman Foundation has been the soil that has truly nurtured my potential and allowed me to present myself as a leader within my community. Being a part of the program has been a great benefit as it has aided me in being able to afford college as well as granting me the acquaintance of the leaders of our future. Although several barriers have presented themselves in my life that try to keep me grounded to the lowest standards of life, the Pullman Foundation has taught me that I may lie upon the moons and stars if I work for it. Instead of teaching to settle for less, the Pullman Foundation has taught me to aim for more and go beyond that. I am proud to be representing the Pullman Foundation because it continues to allow the creation for a better future for several people that are hoping to make their dreams reality. Truly, the Pullman Foundation has aided in changing my world and allows me to take further steps towards achieving the great mysteries of life. 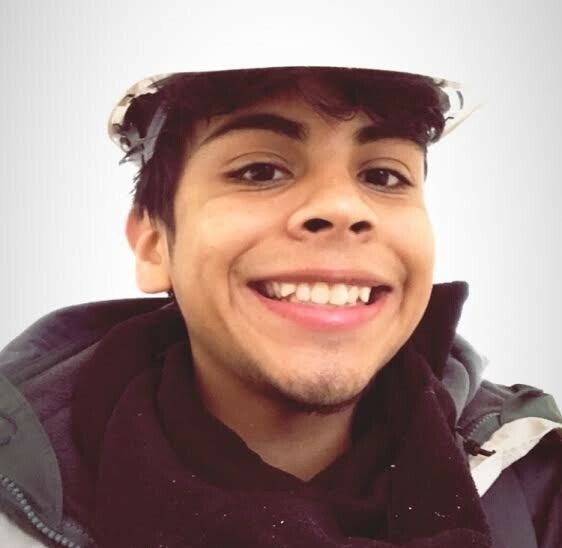 Since 1950, the George M. Pullman Educational Foundation has supported over 14,000 students like Andres with merit-based, need-based scholarships so that they may attend the college or university of their choice. Please join the Foundation’s supporters by making a tax-deductible donation in honor of scholars like Andres and support the Pullman Foundation’s mission of Keeping the American Dream on Track.